In the academic year 2011-2012 Adyghe State University (ASU) got 50 budget places for students-compatriots* living abroad. Students and graduates will be trained free of charge, at the same time students will get stipend of 1,200 rubles (about 40 USD) per month. The arrived students will be provided with comfortable, 2-3 bed rooms in the hostel. The cost of living is 600 rubles (about 20 USD) per year. The working meeting of participants of the project «Bachelor Degree Educational Program in a Direction «Social work» has begun on the 16th of March. The program of a 2-day meeting consists of the module 16 – the Integrating module (the Microsocial environment), the module 17 – Social management and the module 19 – Final qualifying work. Are summed up the open competitions declared within the limits of the federal target program «Scientific and scientific and pedagogical shots». 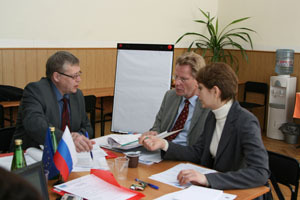 The purpose of these competitions revealing and support of talented young researchers, assistance to professional growth of scientific youth, encouragement of creative activity of young scientists of the Russian Academy of Sciences, other establishments, the organizations of Russia and students of higher educational institutions of Russia in carrying out of scientific researches. The Adyghe State University opens its doors for freshmen. More than two new entrants can be considered as students because they have already received the main document – the student's card. We hope training at our University will bring them not only strong knowledge, but also joyful, disturbing emotions, which newcomers could already had today during the solemn ruler devoted to the Day of knowledge. The chancellor of ASU R.D.Hunagov, mayor of Maikop M.N.Chernichenko, deans of faculties have congratulated first-year students.